It’s a pretty innocuous question, and it’s almost always asked with the best of intentions. But I hate it. I don’t look for mentors. To ask how I find a mentor is to assume some sort of search, which I’ve never really done. Don’t get me wrong, I think mentorship is extremely important and I’ve been extraordinarily lucky to have been mentored by a ton of amazing individuals. However, I’m convinced that this is due to my approach (which I stumbled upon mostly by instinct and luck). 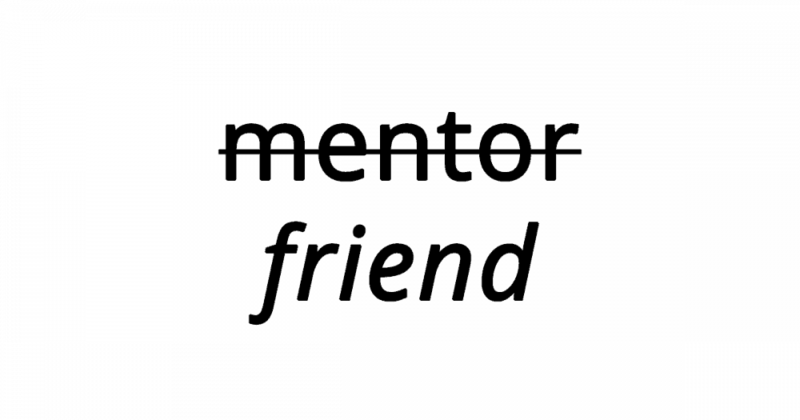 A closer look at a mentor/mentee relationship reveals what it really is: a friendship. Look at mentors through that lens. If you approach finding a mentor the same way you’d approach making a friend, you are going to be much more successful. Conversely, if you approach making friends the same way most people approach “finding a mentor,” you are going to be very lonely. Last night I listened to the Tim Ferriss podcast with Noah Kagan. Noah Kagan was an early employee at Facebook and Mint, the founder of AppSumo, and clearly very accomplished and legitimate. I generally align with Tim Ferriss on his opinions around mentorship (he doesn’t want to help you, he doesn’t have time to help you, and you’re approaching him the wrong way). So I was excited when Tim asked Noah how he’d recommend approaching someone to be a mentor, because I expected some advice that would play to my confirmation bias. What I’m saying is, just like everyone else, mentors are busy. And their time is more valuable than yours (at least to the market). They have no interest in an unpaid, part-to-full-time job helping you with your idea. Even if your mentor was remotely interested and had the perfect background to help your business/idea/pursuit/endeavor/etc…mentors are not a magic bullet. Your success will largely be on your own shoulders to execute. Now, knowing that even with a world class mentor you will be doing the majority of work yourself, wouldn’t you also prefer this mentor to be a friend as opposed some sort of Great and Powerful Oz that you rarely see? So the question becomes: how do you make a friend? Good news: you’ve been doing that your whole life! Friendships are about shared value. The two-way street. That’s not to say you are constantly trading favor for favor, bartering over each other’s services, etc. It’s to say you enjoy each other’s company and time equally. In looking back to my previous example, if someone sent you an email asking, “Will you be my friend?” there is no evidence for you (the recipient) to show that you will equally enjoy this arrangement. If you want to find an exceptional mentor, start by changing your goal to making an exceptional friend.